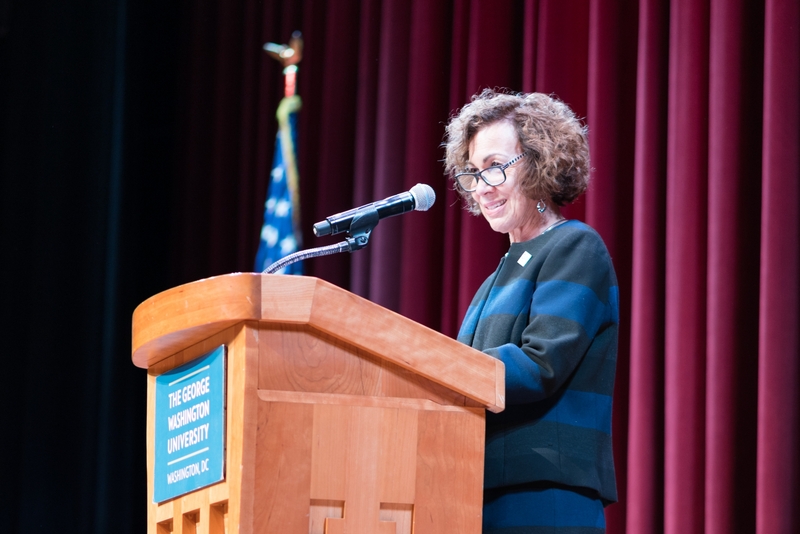 The George Washington University School of Nursing recognized the accomplishments of more than 100 graduates who were welcomed into the profession at the traditional nurse pinning ceremony in Lisner Auditorium Friday surrounded by family and friends. Following a trooping of the colors by university service members, the students filed into the auditorium wearing the white coats they had been presented with 13 months ago when they undertook their education and clinical experience. Pamela Jeffries, dean of the School of Nursing, opened the ceremony by recalling the storied history of the GW School of Nursing. The school was established in 1903 by Mimi Paxton, but was forced to close during the Great Depression. In 2010, Dr. Jeffries noted, the Department of Nursing once again became a school, shifting from academic offerings to becoming a recognized leader in nursing education, practice and service, and one of the top ranked schools of nursing in the country. The keynote speaker for the day was Karen Drenkard, the chief clinical officer and chief nurse of the O’Neil Center of the GetWellNetwork in Bethesda, Md. She has served as a nursing director and on numerous advisory boards at major health institutions in the U.S.
Dr. Drenkard explained that she entered the profession of nursing when unlimited opportunities were available to women and her choice was viewed with skepticism. Students now know, she said, what the skeptics didn’t know then. “Nursing is a powerful profession,” she said. Evoking laughter she spoke of what meal times with nurses are like. “There’s nothing we can’t talk about and continue to eat,” she said. Many of the students receiving degrees are just now entering the profession. Others have already worked as nurses or served in the military and are continuing their education. She encouraged them to continue to study. Outstanding students, including members of Sigma Theta Tau International, the honorary society for nurses, veterans opting for a bachelor of science degree in nursing, and Washington Squared students who did the majority of their medical rotation with MedStar Washington Hospital Center and will go on to work there, were singled out for special recognition. Rose Simonian who was chosen as student speaker, challenged the graduates “to give your best in everything you do and push on through and never stand idly on the shore,” evoking the words of Florence Nightingale who was awarded the cross of St. George for administering to soldiers injured in the Crimean War. Since then, the pinning ceremony has become standard practice for graduating nurses. Before awarding the pins, program moderator Bilinda Tebbenhoff, associate dean of the Virginia Science and Technology Campus and BSN program, encouraged the graduates to create a placeholder in their minds and hearts of humility and gratitude that mentors had communicated to them. “You can do this. You’ve got this. I believe in you,” she said. The pin gifted to GW graduates by Monica Kryszczyk, development and alumni relations coordinator, was created by the first class in 2009. Gold, etched in black and embossed with a cross, it was attached to a blue stole that was draped over the shoulder of each graduate by members of the faculty, a friend or family member, in some cases, parents and grandparents who had also served as nurses. Opening of facility on Virginia Science and Technology Campus is part of school’s fifth anniversary celebration.